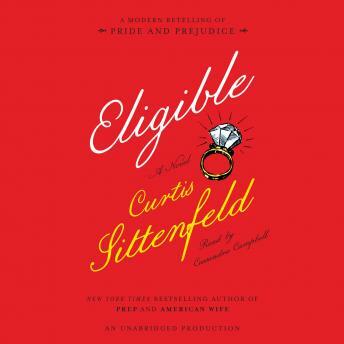 NEW YORK TIMES BESTSELLER • Wonderfully tender and hilariously funny, Eligible tackles gender, class, courtship, and family as Curtis Sittenfeld reaffirms herself as one of the most dazzling authors writing today. I recently finished listening to the audiobook which may have been part of my problem with the way too chipper narrator. Although the story was one I wanted that was hard to put down, I felt myself wanting more depth of character. I was incredulous that Lizzie would have gotten over Jasper so easily and then wanted to marry Darcy after “hate *******” him 4 times. While marrying someone who shows strength of character, is rich, and is chivalrous would be reasons for a woman to marry two hundred plus years ago they no longer ring true today. The same went for Jane and Chip. We know they want to get married after knowing each other 3? weeks or so and then pine for each other for several months. The best way to enjoy the book, in my opinion, is to treat it like a beach read. To truly update Pride and Prejudice and keep to main story line, maybe give the characters more time to suss our their relationship like we do now. If you don’t give it much thought, it is a fun read. Intrigued on the update storyline plot similar to original outcome it was entertaining but somewhat disappointing with the over-detail of mundane events and Liz's irritating character voice. The storyline was dull and the narrator was incredibly annoying. I was interested in listening to this because I enjoy Pride and Prejudice, including remakes. This version was enjoyable, the narration was ok. I didn't like the voice the narrator created for Elizabeth. She made her sound high-pitched which gave off an air-head-like tone. Elizabeth Bennett is anything but an air-head so for me the voice gor her was the least enjoyable but overall, I'm not disappointed. Easy read as an audiobook. Entertaining to say the least.